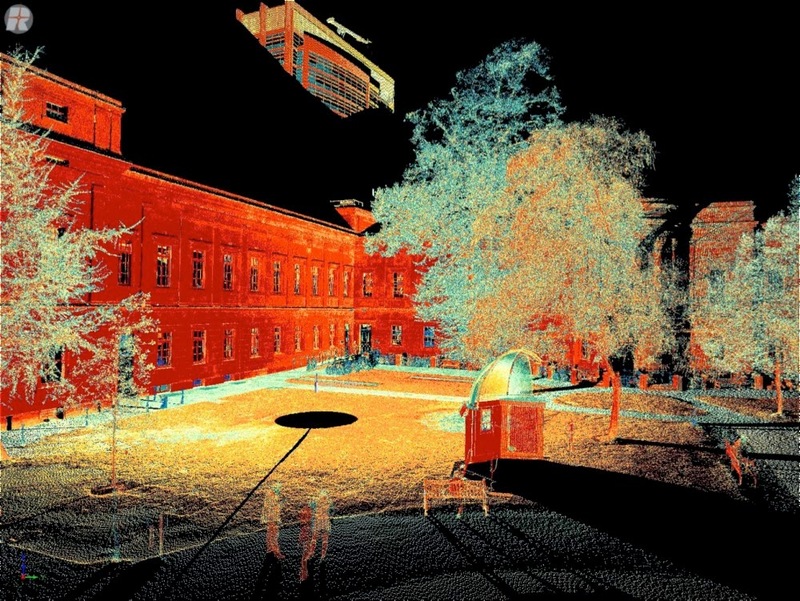 We finally took delivery of our new NERC-funded Riegl VZ-400 terrestrial laser scanner (TLS), or lidar (light detection and ranging) in late March. We've been working with other groups using instruments like this for a while now, including the EO group at Wageningen, and DSITIA in Brisbane, Queensland (and the Biophysical Remote Sensing group at UQ), who kindly hosted me on my sabbatical at the end of 2012. The TLS can measure over long ranges (up to 700 m) at high accuracy, and record waveform information of multiple returning pulses from a single outgoing pulse. This provides much more detailed information than single return laser systems in forest canopies, where targets are not necessarily hard, unlike many surveying applications for which the instrument is designed. The waveform capability is a modification that makes the instrument much more powerful for our applications, and as yet there are only a few of these modified versions in operation. The scanner will allow us to measure trees in very fine 3D detail, including the size and shape of trunks, branches and leaves. Using new tools developed by colleagues in Finland, Germany and elsewhere, we can build quantitative structural models (QSMs) from the lidar data which give the volume of individual tree elements, and then the biomass i.e. the amount of above ground carbon stored in trees. Biomass is a very important property to know accurately, and is very hard to measure directly, particularly for large trees. The resulting 3D measurements will also allow us to explore the relationship between forest structure and function, and address key questions about tree size and shape, particularly across the tropics. 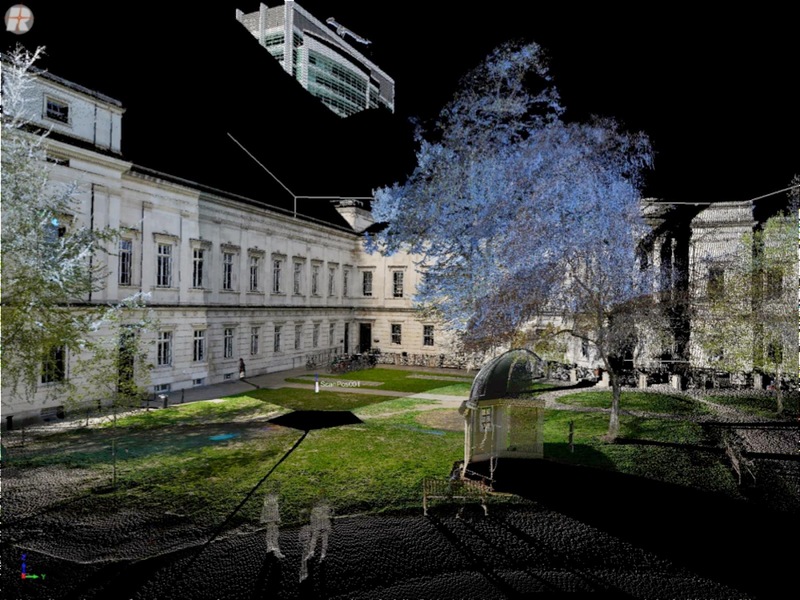 We will also be using the reconstructed trees to develop detailed 3D scenes which we can use to model and understand how light interacts with forest canopies, and develop new and better methods of monitoring vegetation from satellites. We will also be developing our long term collaborations with a number of other researchers interested in terrestrial laser scanning, particularly through the TLSIIG. One of the first scans with the TLS, showing the point data overlaid with the photographic RGB information. The scan location is in the centre of the grass. We can see the black shadows where no information was collected due to the instrument being occluded by walls, roofs etc. My shadow is actually cast on the UCL Geography Dept wall on the far centre-left of the image. Note the ghostly figures of passers by in the foreground, and sitting on the bench. Peeping over the top of the Pearson building in the far background is the upper part of UCLH. Here we are looking at the same 3D points, but now coloured by intensity information i.e. the brightness of the reflected laser pulses. The scale is from blue (low energy return) to red (high energy return). The hard, brick surfaces return more energy than the softer, natural surfaces. We can also see the effects of geometry: returns from surfaces oriented perpendicular to the scan location (eg the walls of the Geography dept, and the wall of the small observatory dome facing the scanner) are bright; surfaces oriented more obliquely are less bright - as we move along the UCL Geography wall towards the North end of the quad, the return intensity drops. The new instrument will allow us to continue and grow our work in scanning forests across the world, building on the work we've already done in Gabon and Australia for example. The animation of the Lope forest plot in Gabon, generated by Kim Calders at Wageningen, from data collected during our joint expedition, has proved a particular hit at conferences and meetings, as it highlights so clearly the power of the measurements. The scan of Billy the Elephant has proved an even bigger hit. We are already moving on with plans for the scanner. Two days after it is delivered we are due out in Alice Holt, to scan the forest there with leaves off (leaves are imminent!). Later in the summer we will be scanning other UK forests, before heading off to the Amazon, Malaysia and elsewhere.